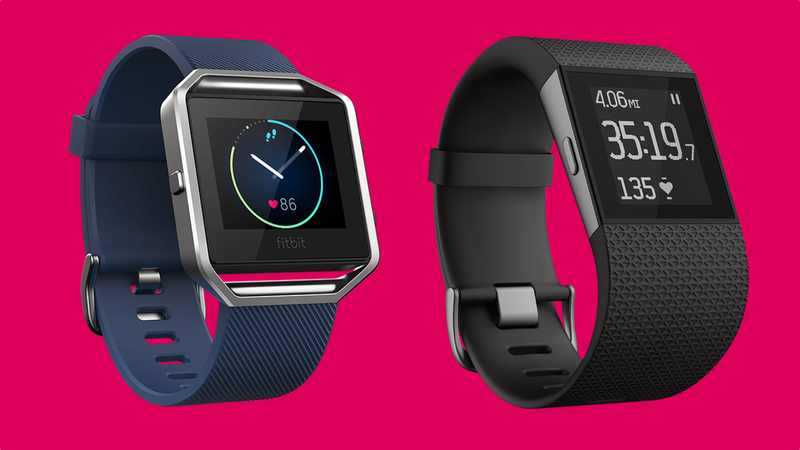 Which of Fitbit's fitness watches is for you? The Fitbit Blaze is the company's first fitness tracker that promises to be equally at home as a watch and a fitness tracker, either at the gym or at work. It's proven itself to be one of the more capable Fitbits you can buy, and will be until the Fitbit smartwatch finally appears. While it doesn't do anything groundbreaking, it still manages to wrap what Fitbit does best in one of its most attractive designs yet and benefits from a series of new software updates to improve its fitness tracking skills. The Blaze sits next to the Surge as Fitbit's "fitness tracker watches" (don't call them smartwatches! ), so there might be some of you wondering whether you should be picking up the Blaze or spending a little extra dough on the Fitbit Surge. We've lived with both of them, so we can tell you what the biggest differences using them day-to-day and which one is the best for your wrist. The Blaze is essentially a much more polished Fitbit Surge, and certainly looks more like a smartwatch than a fitness band. It's slimmer and frankly much more chic than most Fitbits. The metal, angular finish is bold, as is the full colour screen (more on that shortly), and it does a decent job at blending in with a suit as well as your gym kit. Fitbit has been keen to downplay comparisons to the Apple Watch, but the Blaze is comparable in terms of size and design. Is it as good looking as Apple's smartwatch? Not really. But it's a huge step in the right direction, shaking off the more sporty look of its predecessors. The default elastomer band stays though; yep, the one that once caused thousands of users to complain over skin irritation. In our time using it, we haven't experienced any problems. We can't, however, say the same about the Surge (more on that in a moment). Unlike any other Fitbit, the Blaze's strap is more easily interchangeable, letting you snap new bands onto the watch and giving you many more customisable options. In terms of straps, the Blaze comes with either a blue, black or plum coloured bands, but you can upgrade to official alternatives. There are leather bands with steel frames for $99.95, metal link bands with frame for $129.95 and, if you need something a little more wallet friendly, nylon bands for $39.95. If you just want alternate colours in the classic band they'll cost you $29.95. The Fitbit Surge has always been more running watch than day-and-night activity tracker its design reflects. Clad in rubber and plastic, it pales in comparison to the Blaze when it comes to looks and customisation. The only aspect that you can really personalise is the digital watch face you choose to adorn the low-res LCD screen. Available in black, blue or tangerine the Fitbit Surge is one of the nicer looking sports watches out there, despite its monochrome 1.25-inch LCD touchscreen. The Fitbit Blaze is hugely improved in this area with its 1.66-inch, 240 x 180 LCD colour touchscreen. It's hardy full HD, but the visuals are sharp and crisp. The Surge doesn't get the colour touchscreen. Navigation is done courtesy of two buttons on the right for selection inputs, and a single button to the left to move between daily stats and sports tracking function screens. You can also swipe on the monochrome display to switch between activity and notification modes. If you're planning to go swimming with either of these then you're out of luck. Both are considered water resistant, the Surge is 5ATM and the Blaze is 1ATM, but Fitbit doesn't advise taking them for a dip or taking them in shower. A run in the rain should be fine but not much else. We've given them the shower test and they both survived, but it's entirely down to you if you want to take the risk. The Fitbit Blaze feels a lot slicker to use, but the Surge's big old buttons work well when you're sweating through a 5 mile run and need to use the watch. The Surge's software is noticeably zippier when you're swiping through screens through. What are they like to wear all day and night? Generally fine, although the Surge did pose some issues. We had to take it off for one day as it began to cause some itchiness and left a small mark on our wrist. In terms of fitness tracking, the Fitbit Blaze offers very little new. Essentially a Fitbit Alta HR in a different form factor, it will track steps, sleep, sleep stages, calories, 24/7 heart rate data including resting HR and active time. All-in-all a healthy selection of stats and in-line with most fitness trackers from the last year. We've worn them for daily activity tracking and sleep monitoring and both delivered consistent data. The Fitbit-developed PurePulse heart rate monitor is also ever-present, and it uses the same technology as the Surge and Alta HR. Both appear to share one problem and that's handling high intensity training. We put them through some interval running training and spinning sessions along with the Polar H7 heart rate monitor chest strap and both struggled to deliver accurate readings when we upped the intensity. At times they can be slow to display readings as well. So, you want to buy a Fitbit. But which one suits your style, budget and fitness levels? Just how helpful are Fitbit's insights? Both track a multitude of activities, although the metrics returned for the array of supported activities (from yoga to Zumba) are limited to time, average heart rate and calories burned. You can use the stopwatch feature if you like, but the SmartTrack feature means that the Blaze logs activity automatically – as does the Surge. Runners will be dismayed to hear that the Fitbit Blaze doesn't include GPS, which means it can't track distances accurately. You can still use the ConnectedGPS feature, which uses your phone's GPS for distances, so long as you're willing to take your handset along for the ride. We put the GPS powers of both to the test for several runs. With the Blaze piggybacking off our iPhone's GPS and using Runkeeper as a comparison, the Surge was fine for the first 20-25 minutes. Beyond 40 minutes, some discrepancies begin to appear and there can be on occasions a difference of 400-500 metres. The Fitbit Blaze adds on-screen workouts from Fitstar, including a 7-minute all-body workout, 10 -minute abs session and a general pre-workout warm up programme. You will also get Relax Guided Breathing on the Blaze, which you won't get on the Surge. Your Blaze will basically be able to guide you through a breathing session to help you get a bit more centered. The biggest activity tracking feature the Blaze has over the Surge is the ability to track Sleep Stages. The Blaze can use its slightly more advanced heart-rate sensor to track whether you're in deep, light or REM sleep, and tell you the next morning in the companion app how long you spent in each cycle. In terms of features, the Surge offers most of the same metrics for activity tracking as well as a multisport mode for any exercise class that takes your fancy. However, the big ace up its sleeve in comparison to the Blaze is the on-board GPS. This means that the Surge has dedicated running and cycling modes, which you can take advantage without your phone. The Blaze's notification system will be familiar to anyone who has used a smartwatch. All of your notifications on your phone will show up on your Blaze (as long as you enable them in the companion app). While most of these notifications aren't actionable, it's very useful to be able to keep up with what's happening in your life with a flick of your wrist. You'll also get a music control feature that'll allow you to play, pause and skip tracks on your phone; you can even control the volume. Wahoo! The Surge, on the other hand, will only get you call and text notifications. So you'll miss out on all those Facebook, WhatsApp and calendar alerts. It does offer music control, but its annoyingly only available during workouts. The Fitbit Blaze offers five full days and nights of battery life without having to charge. Unlike the Surge, it has a colour screen to operate, which will inevitably reduce battery life, particularly if worn day and night. The Fitbit Surge's battery life is stated to be over a week, and in original tests we barely managed three days when heavily using the on-board GPS for outdoor workouts, which is a serious battery drain. With more liberal use of the GPS, you can get around 5 days, which is about the same we managed with the Blaze. Unsurprisingly, there's no micro USB or wireless charging support. The Surge relies on small charging cable that clips into the back of the device. The Blaze uses a small docking cradle that holds the removable screen in place. Both take roughly an hour to get back to full charge from 0%. The Fitbit Blaze is the cheaper of the two wearables costing $199.95. Adding the more luxurious frames and straps to the Blaze will push the price up. The Surge is priced at $249.99. That makes the Surge the most expensive Fitbit to date. That extra money gets you the GPS chip, but in a significantly less sleek-looking device. It doesn't take too long to realise that these are two different Fitbits for two very different types of people. On the one hand you have the Blaze, which is a fitness tracker at its heart that dresses like a watch, giving it a more attractive design that is more ideal for beginners. We're talking the type of people that want to start making gradual changes to their lifestyle. If you do want to do more than count steps, that's where the FitStar support and the ability to use your phone's GPS to track activities comes into play. It's well equipped for short bursts of exercise, and it's also well equipped for more general well-being stuff like sleep tracking and guided breathing. The Surge is quite clearly for those who are already pretty familiar with a treadmill and already take part in exercise classes at the gym. Its rugged, durable body is built to withstand the rigours of a workout, although we did experience some issues wearing it 24/7. We still have some question marks over the reliability of the heart rate data but the GPS is generally quick to lock on and accurate, making it a decent sports watch all rounder. If we had to pick between the two we enjoyed living with the most, then the Blaze would get our vote. Hopefully the next-gen Surge will take some inspiration from Fitbit's sleek smart fitness watch. Still have some questions about whether to go for the Blaze or the Surge? Let us know in the comments section below. Alas after a year my Surge's strap started bubbling up and after 18 months the screen stopped working. It's now a very expensive ($250) somewhat stylish digital watch. It is unable to track exercises since the screens don't swipe. I had the same problems with my Fitbit Surge. Strap failed out of warranty. Then the screen went Kaput. Since it's out of warranty all Fitbit can offer is 25% off a new one. But WHY do I want another watch with a badly designed screen? This thing cost $250 which, in my book, is pretty expensive. I can live with the messed up strap but the swiping?It still counts steps but is useless for sports, hiking, GPS etc.Now it's, essentially, a VERY EXPENSIVE Fitbit Alta. Very disappointed.